Vicky is my constant source of inspiration these days. So, you’ll get to see more references and links to her recipes during the holiday. Did I tell you that after my daughter’s Xmas cookies party on Saturday, we had our very good friends over for dinner? Well, we did and I had to divide my time wisely between preparing the lamb dish and the welcome appetizer. I hope Vicky will forgive me for changing her recipe so much. I’ll try it to the letter another time and share a post. 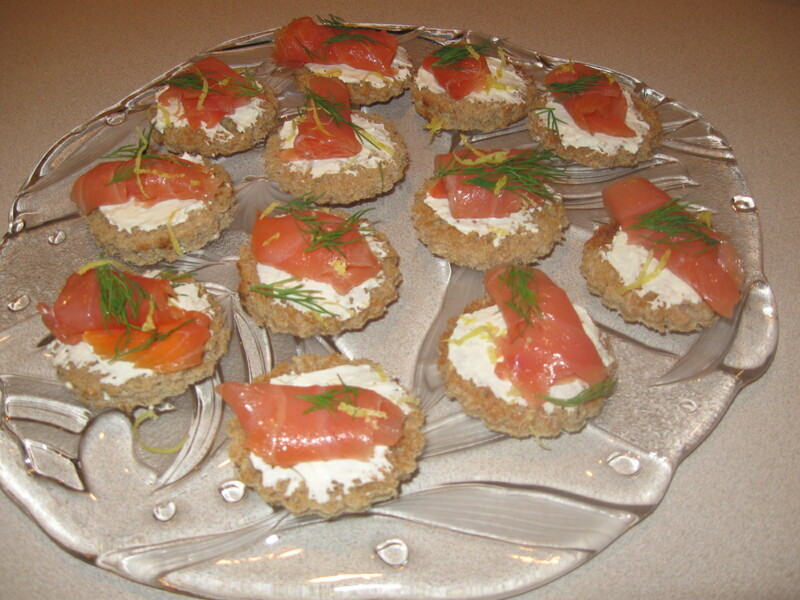 This time, I’m offering you the speediest ever appetizing bites with salmon, cream cheese and toasted bread. The cookie cutters that were lying in my kitchen provided the inspiration for giving the bread their decorated round shape. How to make: Toast as many bread slices as you have salmon for. Make them extra crispy. Use a reasonably sized dough cutter to give them a nice shape. I used this variety. Spread cream cheese on each bite. Add a small roll of smoked salmon. Top with dill and lemon zest. I find this kind of zest peeler super handy. Done!